Working together, Trenton and Kallista learn that Leo Babbage was developing a secret project before he perished. Following clues he left behind, they begin to assemble a strange machine that is unlikely anything they've ever seen before. They soon discover that what they are building may threaten every truth their city is founded on and quite possibly their very lives. In a city where creativity and inventiveness is considered illegal, what do you do with an inquisitive mind? Welcome to the hidden city of Cove. In J. Scott Savage's first installment of his Mysteries of Cove series, Fires of Invention, we're introduced to Trenton Colman, a curious 13-year-old boy who loves anything mechanical. He knows that he can make the machines that run the city of Cove, hidden away from the outside in the center of a mountain, but the only problem is that creativity is considered a crime in Cove. The city was built inside the mountain to escape the dangers that technology created in the outside world, so everything that deals with how Cove is run and managed is very carefully regulated, and anything that is considered an invention is against the law and the inventor is subject to "retraining". Immediately at the opening of the book, Trenton in trying his hand at building a mechanized swing, thinking that this can't be that bad. However, when it appears that Trenton's creation causes a power outage in the city, his punishment to fix the problem leads to the discovery of a tool that he is unfamiliar with. Instead of giving it up to the authorities, he decides to try to discover what its purpose is, which leads him tp Kallista Babbage, the daughter of a disgraced inventor. Together, they start to piece together the clues that Kallista's father left her and begin to assemble the machine that is unlike anything seen in Cove. I think this will be a great book for kids. 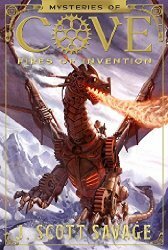 Filled with plenty of action, mystery, and great characters, Fires of Invention is a great blend of a dystopian and steampunk world. The plot continues to develop at a nice pace as we discover each clue along with Trenton and Kallista, and I think kids will really be intrigued to see how the story unfolds. I'll definitely be checking out the next book.